Wow. one month since I made my previous postings. So here is a summary of what happened in February 2008! Chinese New Year was a bit quieter as compared to previous years, I guess people are not really in the mood with the coming increase of fuel price which is due after the general elections. 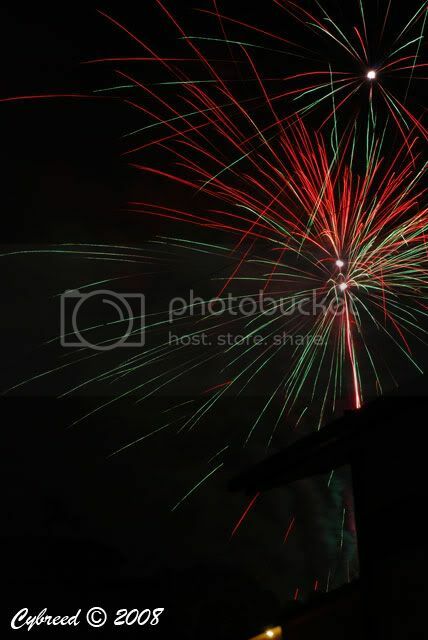 Even then there were more people firing huge fireworks! Well, its a very hectic FEB. I wanna go sleep now, before midnight for once! I was trying to login all day yesterday from my house to blogger.com but some how connection was so slow that every time I tried, it timed out. In any case, I wanted to blog about me finally signing up for gym. Previously my excuse is that I can't find time. Was actually thinking of knocking off earlier and getting to the gym but the nature of my job is not fixed. At any time of the day I might be required to do some reports. So my time for gym now is right after work till around 8pm. I just hope I can keep it up! Anyways I just came back from a brisk walk in Kuching old town. 15 mins walk to the Sarawak Tourism office. Stood in queue for about 10 mins to get tickets for the Rainforest world Music Festival 2007. Yes, finally after 10 years, I'm going to my 1st rain forest. Hahaha I know sad, locals dont go for it. Well what can I say, its designed for tourists! Milk the tourist $$$. hehehe. I'll be going with Nick and his friends. I hope I can go and take some photos and not be drunk or something. Well its now 4 am in the morning. Yesterday I went to see the doctor because I had flu and was coughing for a few days. So last night after dinner, I took the medication and went to bed about an hour later. Woke up around 1.30 am quite thirsty but refreshed for the first time in weeks. Came down to check mail, check multiply and my site. Nothing new... Hmm... surfed a bit, went back to bed. It was quite hot in my room. So I there I was rolling around thinking about the past few months since I started work. And how much I have changed. Time sure flies, 6 months ago, I was a bum. Nothing to do and without a care in the world. Now I have an income, I have work, I made a lot of new friends, and I had interesting encounters with people. Good ones and bad ones. It has always been a fear of mine when dealing with people. I hate people. They hate me. hahaha. I hate them because people are complex, and you do not know what they are thinking. They might be friendly in front of you and then when you turn around they come and back stab you. I guess they hate me too because I'm so unpredictable, moody and overreacting. Most of the time I say stuff and I forget what I said. By doing so I hurt people with my words without realizing it. I seem to piss off many people over the years. I guess its in my destiny code. When I was in KL for about 3 weeks for training of the Data Migration. I saw this fortune teller. He said, I have a flair for artistic stuff, eg, cooking, drawing and creating stuff. Sounds alright too me. Then he said, I cry when I watch EMO movies. Umm. yeah I do.. really I do. Just no one sees them cos they were crying too !!! He said the worse part about me is I hurt people with my words without realizing it and without remorse for what I said. Well I had a suspicion about that for a while now, then when he told me, I realized it was kind of true. My words have always been venomous. That is why I'm selective with my friends. Not many out there can stand me. I think. Maybe I'm wrong. Ahh... well... just to get things out of my blunder of a brain. The newspaper boy just came.. hmmm 4.12 am. time to try and hit the sack again. mmm Im hungry. ps. I lost weight, I'm now 72kg! but I have slightly high blood pressure. Hmm.. does not sound too good now does it. I think I need to be careful of what I eat. this should have been posted two weeks ago. but I have been so busy that I have missed it. cos I need to prep the photos and upload and many other good excuses. 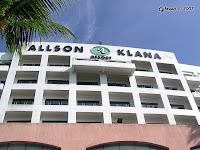 the location of the training is in Seremban, a place called Allson Klana Resort. I personally think it was just a run of the mill type of team building training. I didn't really learn much about teams but I have gained some insights on my personal stuff. Another good thing is I got to hang out with the staff from Peninsular Malaysia, so I now know more about how they work. Also hanging out with Regina was cool. most importantly I got to find a book called Who Moved My Cheese. it was very inspirational and at this stage of my life I like change. I'm trying my best to embrace change. End!!! time to go eat yummy food.